hah sorry I had a moment.. on being confused when i watched hetalia in english . Dude, do Funimation a favor. DON'T WATCH HETALIA IN ENGLISH. It's mind numbingly comfusing and the voices are a crap compared to the Japanese voices. This sounds weird saying this, but Hetalia actually makes more sense in Japanese. I personally liked the English dubbing. They actually have accents and I don't have to read half a screen of subtitles whenever there's multiple people talking. But the Japanese were way unbelievable. At least with the English they had accents. Granted, they were terrible, but I saw that as part of the fun, and it was there. The Japanese all sounded like they weren't even trying to have the accents, just the acting. I think it would just sound bizzare if the Japanese people doing the voices tried to do another accent. It also might be hard for them as well. Just look at Kuroshitsuji and Hellsing. All the the characters are British (besides some of the German characters in Hellsing) and they don't even attempt to do accents for them, but they still sound amazing. ^Well, they just seem to replace a lot of subtle story lines with jokes. The English dub, at least to me, just seems to be a big joke fest and that's what they focus on. Not to mention a lot of the jokes in the English dub are waaay different than what was being said in Japanese (and also a lot more offensive, at least I thought so. )The narrator also seems to just ramble and simplify things instead of just telling us what's going on. Hmm... I guess that would make sense on how it'd get lost. Though honestly, I didn't get the feeling of a true storyline from it, anyway. they go back and forth with a couple of story lines that it's like they're telling two different stories. I'm assuming it's because at a certain point, the two tales will become relevantly combines somehow. ^Well, they just seem to replace a lot of subtle story lines with jokes. The English dub, at least to me, just seems to be a big joke fest, and that's what they focus on. Not to mention a lot of the jokes in the English dub are waaay different than what was being said in Japanese (and also a lot more offensive, at least I thought so.) Not to mention the narrator sometimes seems to just ramble and simplify things instead of just telling us what's going on. I agree. I was actually borderline furious (mostly at Funimation) when Russia was talking and he mentioned something along the lines of, "and the only friend i had growing up was a Yak.". I seriously don't know why, but that just pissed me off. Also, they've mentioned things about Hitler in the anime on more than one occasion, which is what us fans are seriously trying so hard to keep away from the fandom and the anime/manga. ^I know. I can understand a nazi joke here and there because a good majority of it takes place during WWII, but a lot of those were just...no. Like Germany saying, "Do you want me to gas you?" Dude, not cool. They also threw in nazi jokes when it wasn't even supposed to be during that time period, which was unecessary and offensive. Also, was I the only one that found that lady narrator to just be really annoying? Basically, they turned a cute, funny, stereotype-like humor anime into an annoying, racist anime. I thought it was supposed to be racist. I've heard most people saying that's why it was funny before I heard that FUNimation had picked it up. It pokes fun at stereotypes for different groups of people. I'm sure if the jokes started out as racist as they made it in the dub, Hetalia would have WAY less fans and more people hating it. ... Hellsing. All the the characters are British (besides some of the German characters in Hellsing) and they don't even attempt to do accents for them, but they still sound amazing. Whaaat, I thought the Hellsing dub did have accents. Most dubs these days are pretty swell, or at least not laughably horrible like they used to be, and well done accents can really enhance the experience. I think Baccano! is a great example, the Japanese voices are nice but the dub cast just did a phenomenal job. In the English dub they do, but not in Japanese. I was only making a point that it would be harder for the Japanese voice actors to do accents of different countries. Also, i actually was very impressed with the accent in the dubs of Hellsing and Kuroshitsuji (and some other animes with people with accents), but the accents in Hetalia were just bad...at least i thought so. Ahhh I see what you were saying. I love Japanese engrish accents. Well, the people who first introduced me to the series refered to it as funny cute racism. Poking fun at stereotypes is a form of racism. I thought it was part of the joke in the English dub, especially sinec the Japanese didn't even try. There's people who are trained to teach accents to actors for their roles. Basic high school teachers could have helped out, too. I just think the Japanese didn't care enough to try because (from what I've heard from a couple of English voice actors) the Japanese audience is a lot less picky about this stuff compared to the American audience. Except when the stereotypes aren't based on race, but rather Ethic differences and poking fun at culture differences as well. Calling it racist would imply that everyone living in one country is of the same race. Let's use England as an example, shall we? Everyone living in England (Or rather the United Kingdom of Britain) is British, but they are not all white, or Indian or Black, or Asian. Same goes for any other nation. The best way to describe Hetalia is a humorous take on World History, mainly revolving around World War II, from the Axis Powers point of view, using satirical parodies of cultural differences of the nations as a means of characterization. Racism is mean and is used to hurt people's feelings and/or make other people think things that arn't true about another country's people. Stereotypes are used to poke fun at people from a certian country in a non-harmful or hateful manner. Example: Saying that 'Americans are fat unhealthy pigs' would be racist. Yes, it is true that obesity is more common in America than any other country (sadly), but that doesn't mean EVERY SINGLE American is fat and unhealthy. Hell MOST of them arn't. Saying something like, 'Americans eat a ton of hamburgers' would be a stereotype. No, it's not true that every single American eats a ton of hamburgers, but if you look at the statistics of fast food consumption in the world, America comes out on top. Also the fact that you can notice very quickly that just about every town in America has some sort of fast food place. It's the same thing. The only difference between the racism in Hetalia and the racism that you're referring to is that Hetalia is doing it to be funny. It's still racism. I'm not saying that stereotypes can't be hurtful, because they can offend some people. I'm mostly trying to get a point get a point across that racism is sort of a harsh word what Hetalia is trying to put out there...They're just poking fun at stereotypes, and i have no problem with that, it's just that Funimation sort of took it too far with a lot of the jokes they threw in to the dub. Really, I don't know if there is a clear delineation between "racism" and "stereotype". But I think the gist of what people have been trying to say, which is the important thing, is that Hetalia sub playfully flirts with offensiveness. 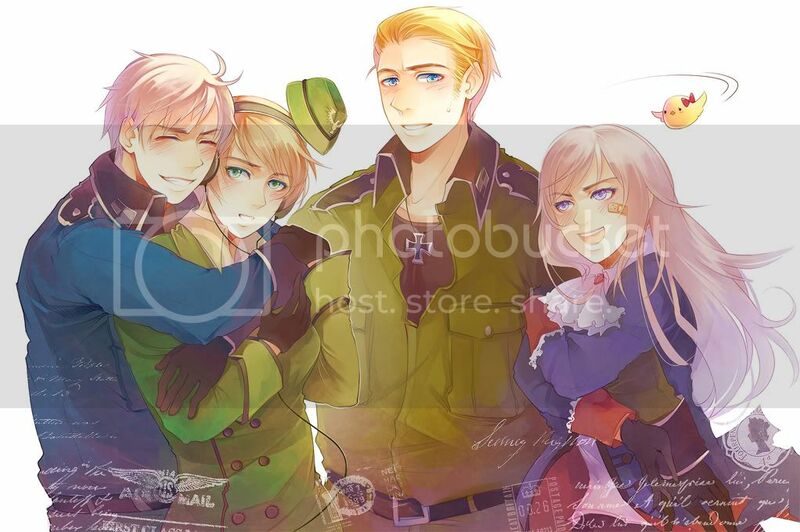 Hetalia dub gets in bed with it and screws like bunnies. Even if they both technically exist on the same spectrum of "racism", there's a vast difference between "brother" and "n*****". I believe what they're trying to say is that there's a similar difference between the original dialogue and the way the dub writers reword the jokes in Hetalia. It wouldn't be the first time I've seen or heard of dramatic rewrites in an attempt to make it "funnier" or "more understandable", and they usually fail. Man of the Public's definition was quite good. I think they did a good job with explaining the differences between the two. 1.a belief or doctrine that inherent differences among the various human races determine cultural or individual achievement, usually involving the idea that one's own race is superior and has the right to rule others; hatred or intolerance of another race or other races. 1. a simplified and standardized conception or image invested with special meaning and held in common by members of a group: The cowboy and Indian are American stereotypes. You have the right idea there, but Spanish isn't a race it's an ethnic group. Races would be like Caucasian, Asian, Black, Indian, Native American/Mexican/Inuit, and Middle Eastern. Ethnic groups are based on where they're from, British, American, Spanish, Japanese, etc. The easy way to remember is race is based on psychical traits, while ethnicity is based on cultural traits. Oops, sorry ^^; My mistake. No need to apologize, it's a simple mistake. Some of you guys do make good arguments; perhaps the best way to sum up and compare how I'm looking at it is that you guys are saying "squares are not rectangles." Stereotypes fall under racism. It is a form of racism. I have yet to see anything offensive in the series (but then again, I've only gotten to ep. 13). I've since found some of these episodes in Japanese, and the "stereotypes" seem to be at the same level of "offensive" in both. To be honest, it looks to me that y'all are whining too much about something meaningless. If I'm wrong, give me the episode number which has such an example, and I'll watch it in both langauges. I'd like to see if there is any legitimate proof to these claims. Sorry, last minute add in: I wanted to say that I'm not trying to be a jerk about this. I only started to try watching Hetalia because my fiancee is into it and someone on these forums (unfortunately I forgot who) said something that intrigued me enough). I want to learn what I can about this show, and so far haven't seen what y'all are claiming to have seen. I'd like someone to point this out to me, as a favor. Ok, to sum it up in a single sentence: Funimation just took it too far with the jokes. They could have left out about half of the added jokes out of it and it would have been nearly perfect. Me, and a ton of other people, like the dubs to be as acurate to the Japanese version as possible. But Funimation were basicly going by "This anime is offensive and extremely ADD so we should make it more so!". I don't think i need to argue this any further. It's just for a person who's watched every single episode about three times over, i can tell that Funimation added a lot of very unnecessary jokes in there (that i can tell you, and just about any other Hetalia fan can tell you, are WAY worse than what Hetalia had in the Japanese). Well this discussion is going nowhere. I've broken it down as much as I can and can only do so much. I'm studying/majoring in Anthropology and the topic of racism and stereotypes has been brought up several times, especially in cultural Anthro, we have discussed the differences of both. So maybe we should just move away from this topic since it's not getting us anywhere? I wouldn't say that we're "whining" I honestly don't mind them, just find some parts more offensive than others (but I still enjoy it.) It's merely that the level of offensive material is slightly higher in the English dub. Like the number of nazi jokes in the English dub compared to the Japanese dub. There is one episode that I can think of in particular, I don't recall the episode number, but it deals with Germany, Japan, and Italy asking a bunch of different countries questions about how they celebrate Christmas. The Japanese dub, from what I remember, really didn't have anything that could be considered "offensive." There were, however, a couple of lines that may be considered slightly offensive in the English dub, like saying "Meanwhile, in Godless Russia" or "Meanwhile, in God-lesser China" and a part at the end where it sounds like Italy is saying "Heil Jesus in Deutschland!" There are definitely worse examples in the series, these, at least to me, aren't as bad, but there is a definite difference in the offensive level when the Japanese dub just says something like "Meanwhile, Russia's Christmas" or "Meanwhile, Christmas in China." Starting to sound like a good idea. OH!!! There's another reason why I've been watching the show! Crossplay! I've noticed that almost all of the Hetalia cosplayers that I've seen are females going as male characters. (For a while, I thought this may have been because there was ONLY males). I thought it'd be fun to pick a female nation to go as, so I'm researching the best option. (So far I've only seen Hungary, and I'm thinking "not for me"). I'd also like it if there were an Israel (as I've stated before), but it sounds like it's probably not going to happen. That does it. I'm not even going to argue about this anymore. I actually love the Hetalia dub. I think the voicing is amazing, and I actually got everything out of it as I did the Japanese series. I never found the show to be racist, but I guess it could be if you're on some parenting website. I think the jokes are not meant to be hurtful. But I really like the accents. I think it adds a lot to the series, though sometimes I have to watch a clip or two over again as they are talking very quickly and it can sometimes be kinda like "WHAT THE HECK DID THEY JUST SAY?" though sometimes I have to watch a clip or two over again as they are talking very quickly and it can sometimes be kinda like "WHAT THE HECK DID THEY JUST SAY?" A valid point, especially with this series; it's also how I feel about subtitles. To be honest, i could never force myself to finish or really get into this show, but when i heard of the dub impending i made a point to find the first ten episodes or so to laugh at whatever sort of cluster**** would take place. I mean, most dubs for simpler, less frantic sounding shows end up horribly, so i was convinced they could do no right by attempting Hetalia. I was surprised. It reminded me somewhat of Baccano! dub, in that, it managed to add the right accents without making it sound forced, and didn't take much away from the experience. It's sort of a gem, not only because it managed to NOT fail horribly, but because it kept the feel of the original japanese audio almost perfectly. At first, i HATED the dub. i couldn't understand a single word they were saying. but after watching the entire season one dvd, it turned out okay. funimation has a history of destroying anime with their dubs but they didnt do as bad as they usually do on Hetalia. the one thing i liked about english Hetalia was the references that they made. like when England was summoning Russia and he said "Dumble-dora the explora." XD that part cracked me up. but fem!Prussia is not a gender blend of the character prussia. But if insted of making prussia a boy, what would it be as a girl... and thats what nyotalia is... so they are not gender bland but completely differant characters. So, "Nyotalia" is the artist making rule 63 apply to the male characters...? yes! and also females to males. But the are differant characters so they are not direct gender blends. just the country personified as a differant gender.